The Bridge was built on a very modest budget. I was able to reuse some audio equipment I already had available to keep costs managable. 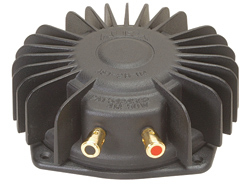 I chose economical components from well known manufacturers to ensure decent performance yet stay within budget. Over time, I am upgrading most of the components as funds and desire permits. 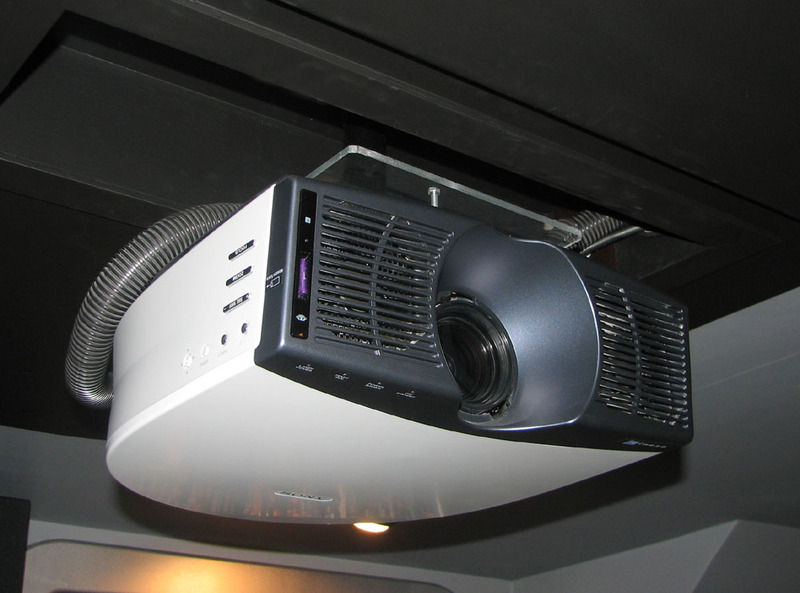 The theater was updgraded on October 27, 2010 with a new Epson Home Cinema 8350 Projector. This has been a huge improvement over the previous projector, a Sony Cineza VPL-HS20 projector installed on November 27, 2003. The Sony performed admirably for almost 7 years but was showing its age. This new Epson is a full HD (1920x1080) 3 LCD unit. This is a fantastic machine with excellent brightness, contrast and colors. This new projector cost about 1/3 of the Sony's original purchase price. An incredible value. 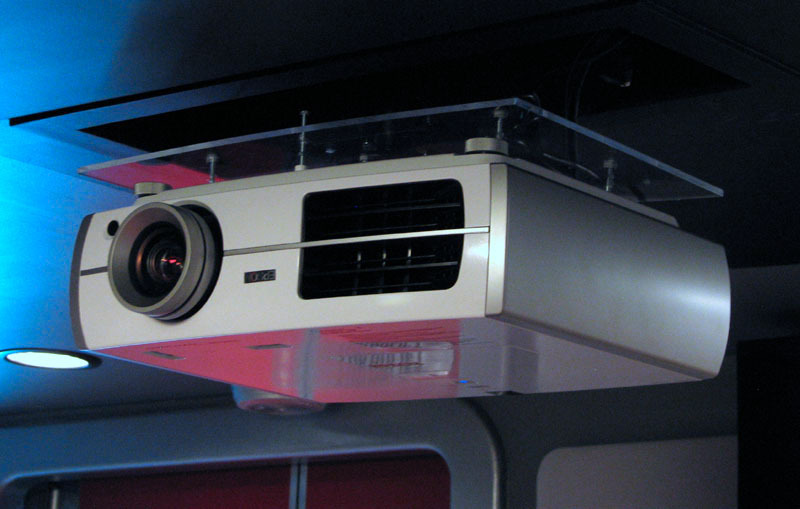 The original projector in the theater was a Sony VPL-HS20. 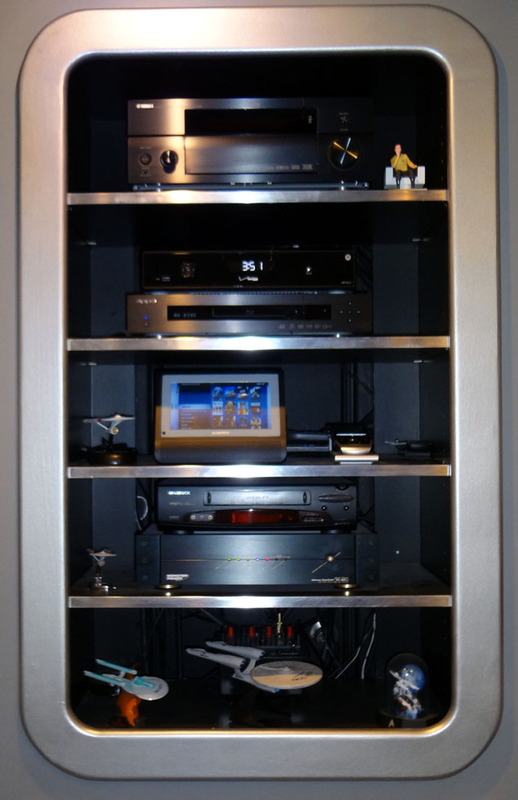 In December 2010, I acquired a new Oppo BDP-93 Universal Network 3D Blu-Ray Player to replace my Panasonic DMP-BD35 player. The Bridge uses a 7.1 channel Yamaha RX-V1600 Dolby Digital EX, THX Select2 Surround Sound Receiver (120 watts x 7 channels) as the main audio component. It is driving 3 Polk CSi-130's for the front and center channels, a pair of Polk FXi/50's for the surrounds and a pair of Polk RT15i's for the rear channels. 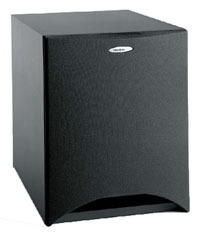 The powered subwoofer is a Velodyne CHT-12. A Bass Shaker Pro is installed under each of the front row seats to augment the subwoffer. 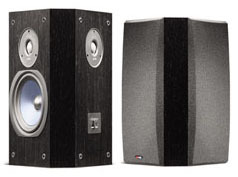 They are powered by a Dayton SA100 100W Subwoofer Amplifier. In April of 2007 I upgraded my television service by switching to Verizon FiOS. The picture quality is fantastic compared to my previous cable provider (Comcast). I am now using a Verizon-supplied Motorola High-Definition QIP-7232 DVR to provide both HD and SD TV signals to the projector via HDMI. In 2014 I replaced all of the X10-based lighting controls with new Insteon ones. 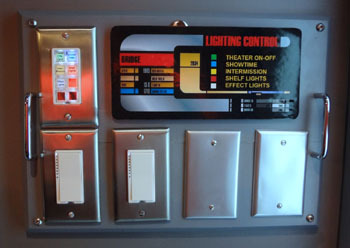 Here is the master lighting control panel which contains 3 of the four control units used in the theater. The fouth control is near the media library for easy access. The Insteon system allows me to program the various dimmers and switches to achieve multiple lighting effects, everything from all lights on to all light off and several combinations in between. To save money, I have constructed all of the screens myself. I built three different versions, the first, a 100" diagonal 16:9 wooden frame and "blackout cloth" screen; the second, a 102" diagonal 16:9 with an aluminum frame and a matte white vinyl screen; and the third and current screen a 125" diagonal 2.35:1 widescreen (see photo below). For details on the building of the first two screens, visit my DIY Projects Page. 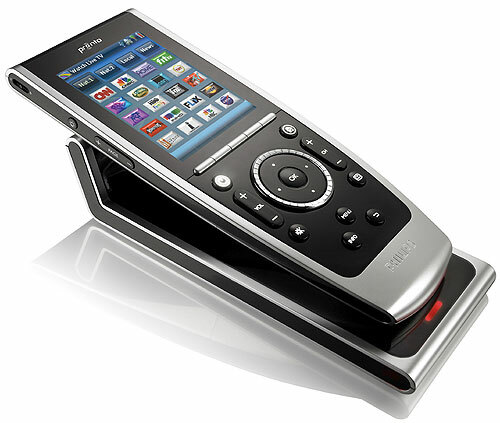 For the theater remote control I chose the Philips Pronto TSU9400. This is a color touch screen remote with multiple hard buttons. A key feature is that it can be programmed and the user interface designed using your PC. The benefits to me are that I can put just what buttons I need on the primary screens and leave the others elsewhere. Also, with my aging eyes, I can design the buttons so I can read them without reading glasses, a problem with many other remotes. The hard buttons allow quick access to common functions such as volume, stop, play, pause, etc. 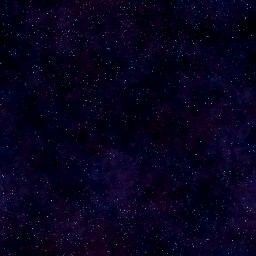 without having to look at the touch screen at all. For power cleaning I utilize a Monster Cable HST-2500 unit. 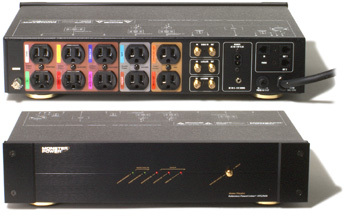 It provides power to the equipment in the rack as well as the projector. 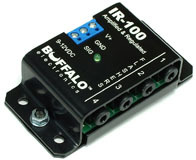 For IR distribution (to get the remote control to work the stereo when the units are located behind and to the side of where you sit) I again chose www.smarthome.com and their IR distribution equipment. It turned out to be relatively inexpensive and provides just the features I was looking for.